Trojan J185G-AC Floor Machine Battery, Free Delivery to many locations in the Northeast. 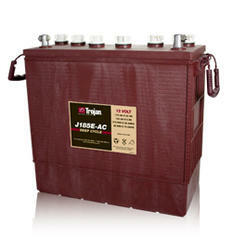 Trojan J185E-AC Deep Cycle Battery, Free Delivery to many locations in the Northeast. Call 888-787-5681 or Email us usabatterysales.com@gmail.com with your location before ordering to see if you qualify for our free delivery offer. The Trojan J185E-AC batteries are sold with core exchanged at the time of the delivery. If you don't have a core the core charge is $54.00 per battery. Length 15 1/2" Width 7" Height 14 5/8"